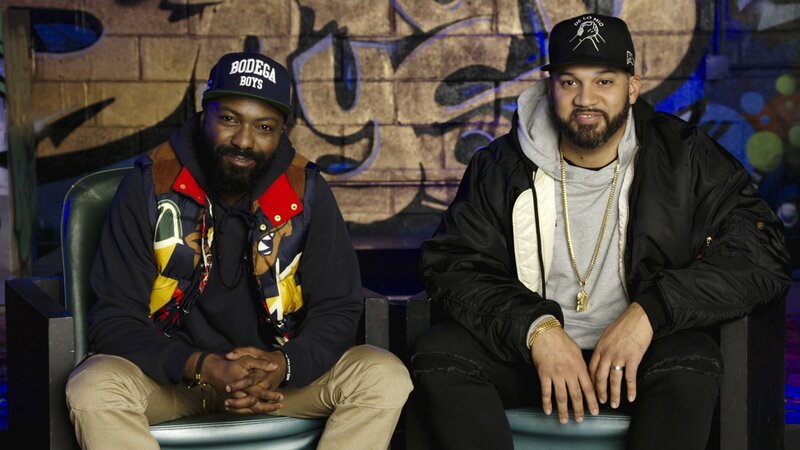 Popular TV and podcast personalities Desus Nice and The Kid Mero speak off the cuff and chat with guests at the intersection of pop culture, sports, music, politics and more. The quick-witted duo brings a distinct voice to the late-night talk show genre, delivering smart and comedic commentary on any and all topics, that keeps audiences buzzing. Illustrious guest: fellow Bronx native Congresswoman Alexandria Ocasio-Cortez. Series premiere. Desus Nice and The Kid Mero sound off on pop culture, politics, sports and more; illustrious guest: Don Cheadle. Desus Nice and The Kid Mero sound off on pop culture, politics, sports and more; illustrious guests: Vince Staples and John Legend. Desus Nice and The Kid Mero sound off on pop culture, politics, sports and more; illustrious guests: Ben Stiller and 2 Chainz. Illustrious guests: Lupita Nyong’o, Winston Duke & Kirsten Gillibrand. Desus Nice and The Kid Mero sound off on pop culture, politics, sports and more; illustrious guests: Carmelo Anthony and Jordan Peele. Desus Nice and The Kid Mero sound off on pop culture, politics, sports and more; illustrious guests: Stacey Abrams and Anna Kendrick. Desus Nice and The Kid Mero sound off on pop culture, politics, sports and more; illustrious guest Sen. Cory Booker (D-NJ).